Add a quick and fun way to see all the top sights in Miami by booking this 30-minute jet ski tour -- it will definitely be a great addition to your stay in South Florida. Your guide will take you around Biscayne Bay, Miami Beach and Downtown while pointing out celebrity homes and giving you other fun facts. All necessary equipment is included. After checking in at the starting location in Coconut Grove, located just 15-minutes South from Downtown Miami, you'll meet your guide and get acquainted with your Jet Ski before your tour. As you follow your guide through the beautiful waters of Miami, you'll be taken for a ride around Biscayne Bay and Key Biscayne. You'll ride by Downtown Miami and Miami Beach where your guide will point out the many celebrities houses and hot spots of Miami by the water. 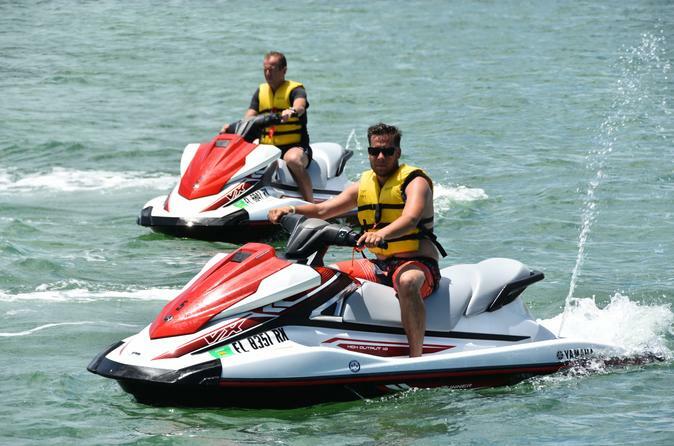 The price displayed is per jet ski, each jet ski can hold two (2) passengers. As this is a tour, you will not be able to switch drivers while on tour. The minimum age to drive is 16 years old. Customers born after January 1st, 1988 must bring ID and be prepared to pass a Temporary Safe Boating Test ($3) in order to operate the Jet Skis. If you are required to take the test, please advise in the Special Requirements field when making your booking.